Overnight guests are most welcome at the monastery. 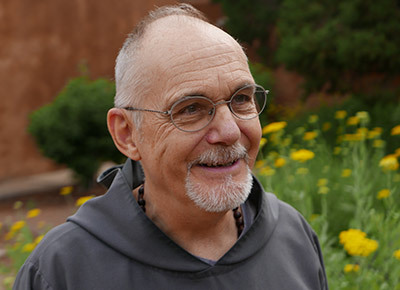 A guestmaster monk is assigned to be in charge of the guesthouse. He will be of service to our guests, assuring that they are comfortable, at ease with their surroundings, and able to answer their questions. He is responsible for the resident guests upon their arrival and during their stay. He may be reached in the guestmaster’s office, directly across from the Giftshop, or by an intercom system posted on the outside wall of the office a few steps from the front of the church. Simple fresh meals are provided as part of your visit. 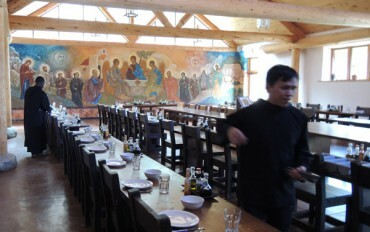 The daily main meal and light suppers are shared with the monks in the refectory. A light breakfast is available after Mass. Normally we do not serve red meat at meals, although there have been some exceptions for special celebrations. Simple vegetarian fare such as rice and beans is always available. Meals are held in silence, except for table reading or music. We are obliged by the Rule of Saint Benedict to offer hospitality to our guest as though they are Jesus Christ. Included is the opportunity for our guests to share in the Benedictine way of life. Guests are always welcome to attend any or all of our daily prayer services as well as holy Eucharist (see the daily schedule). They may also participate, if desired, in short times of manual labor (three and a half hours maximum) under the direction of our monks. To aid all of our guests in their quest to seek God, an atmosphere is maintained that provides time for privacy, prayer, reading, and reflection on God’s Word speaking in prayer services and the liturgies. The atmosphere most conducive to this kind of sharing of our life includes silence and some solitude. Are visitors from all faiths welcome? How do I get there? What do I need to bring? Am I required to attend services? Can I go hiking? Answers to all these questions are provided in our detailed visitors guide. Updated at 5:00 am Tuesday, April 23, 2019. The road leading to the Monastery, Forest Service Road 151, is passable for all vehicles. However, we are getting rains and so two-wheel drive vehicles may have a difficult time due to the road being muddy and slick. 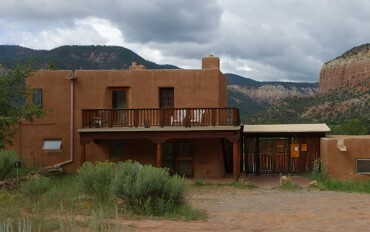 Schedule your own self-guided retreat with us.